Federal regulators’ approval last week of SPP’s request to terminate an interconnection agreement with the proposed Tres Amigas “superstation” won’t hurt plans to unite the three major U.S. grids, developers said (ER15-1797). The Federal Energy Regulatory Commission’s ruling ending the agreement with Xcel Energy’s Southwestern Public Service noted that Xcel and SPP are “willing to work with Tres Amigas” on a new interconnection agreement once the developers can meet contractual milestones. SPP filed the termination request in May after the company told FERC that Tres Amigas had failed to make an initial $1.4 million payment. SPS said it had already agreed to cut the payment from $7.5 million and that it extended compliance deadlines four times, delaying the agreement’s commercial-operation date by two years. Xcel said that Tres Amigas made “no appreciable progress toward placing its transmission line project in service or interconnecting with the SPS transmission system,” creating uncertainty for SPS as it plans its transmission system. Stidolph said making that payment would have committed Tres Amigas to spending $500 million immediately. “That was not a good use of capital for us,” he said. 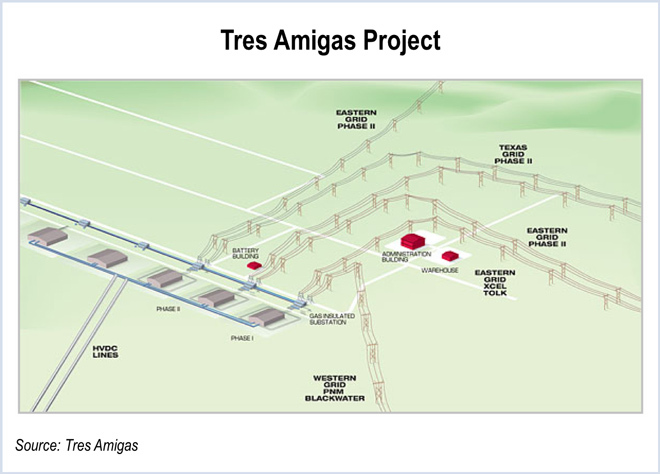 SPS would provide Tres Amigas with its link to the Eastern Interconnection. The project would be built on 14,400 acres in Curry County, N.M., near the city of Clovis and the Texas border. Project developers have been slow to raise funds for the $1.6 billion project and have yet to set a groundbreaking date after initially saying construction would begin in 2014. In January, Curry County commissioners voted unanimously to ask the state to reallocate $350,000 intended for Tres Amigas, so the county could use the money elsewhere. Stidolph said Tres Amigas is finalizing agreements with wind developers that would ship power from eastern New Mexico to the west. The interconnection agreement, originally filed in 2013, would have linked a 73-mile, 345-kV Tres Amigas-owned transmission line providing a 750-MW, two-node intertie between the SPS transmission system in the Eastern Interconnection and the PNM transmission system in the Western Interconnection. The project may also be facing further roadblocks in Texas, which has long prided itself on having its own electric grid, exempt from FERC regulation. In June, Texas Gov. Greg Abbott signed into law a bill that gives the Public Utility Commission of Texas the ability to sign off on major power lines connecting ERCOT to multi-state grids elsewhere. State Sen. Troy Fraser, the bill’s author and a long-time proponent for the Texas electric industry, believes the state should make those kinds of decisions. “These interconnections can create tremendous risk for our electric system, including having Texas lose control over its own electric system,” Fraser said during hearings in March. The bill says electric utilities or municipally owned utilities “may not interconnect a facility to the ERCOT transmission grid that enables additional power to be imported into or exported out of the ERCOT power grid,” unless a certificate of convenience and necessity (CCN) is obtained from the PUCT. The bill requires the application for a CCN be made at least 180 days before the developer seeks a FERC order related to the interconnection. Tres Amigas is one of several projects managed by Connecticut-based AltEnergy, an investment fund focused on alternative energy and agriculture. FERC approved SPP’s request to correct and resettle $13.1 million of transmission-service invoices dating back to 2009. Xcel Energy has asked FERC for an $88.7 million interconnection switching fee from Lubbock Power & Light for disconnecting from SPP.